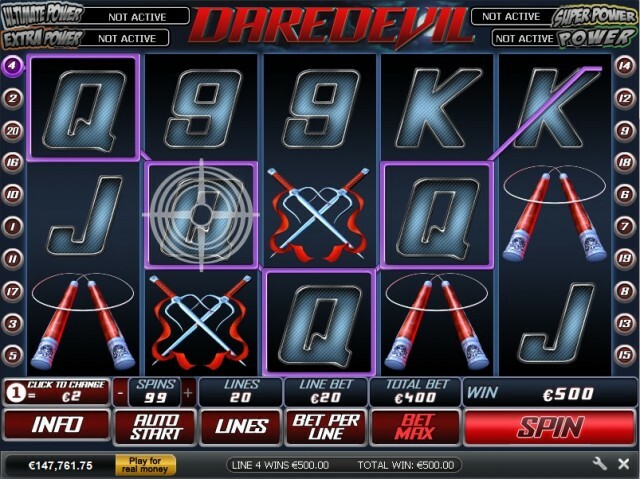 A fictional story from Marvel Comics is the basis of this highly interesting 5-Reel 9-Payline Progressive Video Slots game called Daredevil Slots. The main character is a blind Superhero with heightened senses and the ability to perceive objects. This Slots Game is provided by Cryptologic. Daredevil offers a combination of three Progressive Jackpots, wild symbols, multiplier symbols and a Bonus Game. Play the Daredevil slot at the highly recommended Casino Tropez. The Game offers a very innovative theme based approach to the game, with the symbols corresponding to the actual characters of the Comic Book. There is Matt Murdock, the main character, Elektra, Bullseye and the Kingpin, all present in the game. The Daredevil logo appears as a Scatter Symbol offering you higher winning, and Daredevil in all its original dress present as a Substitute Symbol to better the winning odds by a great margin. There are other symbols present as reel items, all taken from the original script of the classic comic, giving a true appeal to the Game. The other symbols are props like Boxing Gloves, Swords, newspaper cuttings and drums present in the game among others. Daredevil appears as a Wild Symbol in the game. It appears on Reel 2 and Reel 4 and can replace any symbol except the Daredevil logo which is a scatter symbol. Also, if Daredevil appears in a winning combination, the prize is doubled. Daredevil Logo appears as Scatter symbol, and if it is present on two or more than two, the players get guaranteed winnings. Having more than three Scatter Symbols on the reels initiates the Bonus Feature of the Game. The bonus gameon the Daredevil slot is a very simple yet intuitive one with great chances of winning. The reels are darkened and the player needs to match three Kingpin symbols. The earlier the player matches them, the better the bonus amount. Daredevil Slots offers not one or two, but three Progressive Jackpots which are hit very frequently. The largest share of the Jackpot is present on Marvel Hero Jackpot, which is a part of Marval Themed Slots combined Progressive feature. The other two Jackpots are the true value Super Hero Jackpot and the modest Hero Jackpot. The Jackpots are not based on your winnings of the game but are randomly selected to be offered to the players. The Jackpots are based on the players risk taking appetite. The more the player bets, the more are the chances of winning the Jackpot. Intercasino Featuring Dare Devil and all the Marvel Slots, Intercasino comes highly recommended. Casino Tropez has the latest version of Dare Devil.